Rollercoasters are a big part of the thrill-seeking experience at Walt Disney World. While they may not be as large or have as steep a drop or scary an inversion as other parks, they still offer some of the most unique elements and wonderful storytelling in the world. But just how did rollercoasters come to be the hallmark of a pleasure outing? Turns out we need not go far, or dig around in any history books, to find our answer. In the Spring 1996 issue of The Boardwalk Bugle, The Boardwalk’s guest directory/newspaper, gives us a concise, yet thorough, history of these wheeled-wonderlands. You can read The Up and Down History of the Roller Coaster below. Though it may be hard to imagine, the roller coaster appeared on the scene years before the car. In 1804, the roller coaster first used the wheel as a source of transportation or rather amusement, at a public garden in Paris. But the ride, called the “Russian Mountains,” a sort of buggy on tracks, flopped since people were more interested in another thrill seeking attraction, a predecessor to the roller coaster – slides. Early Russians amused themselves on ice slides, a sort of toboggan run that provided downhill excitement. Those big, long slides you see at theme parks today are the direct descendants of the ice slides. However, when entrepreneurs in France wanted to bring ice slides to their climate, the warmer weather proved to be a hindrance for year-round fun. So, someone got the bright idea to build a track comprised of rollers in which the toboggan “rolled” down. It was a hit. Not until 1884 did we see the first American ancestor to the modern roller coaster and it debuted at, where else, Coney Island. LaMarcus Adna Thompson receives the credit for constructing a gravity-powered ride that gave participants the thrill of a lifetime. 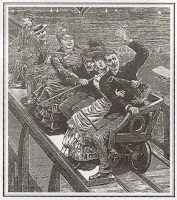 Thompson’s Gravity Pleasure Railway took patrons down a track that then sloped back up and sent them back downhill again. A cheap thrill for only a nickel. Its monstrous success meant roller coasters were here to stay. And for Thompson, the competition got fierce. Two of his competitors, Charles Alcoke and Phillip Hinkle, each built newer and better variations of Thompson’s original. Thompson fought back with the Scenic Railway in 1887 at Atlantic City. It contained dark tunnels with spooky effects, electric light shows (remember, electricity was a novelty back then) and a cable grip that grabbed a moving power cable beneath them for uphill momentum.